Is there any way to tell from a picture whether a bear is mohair? 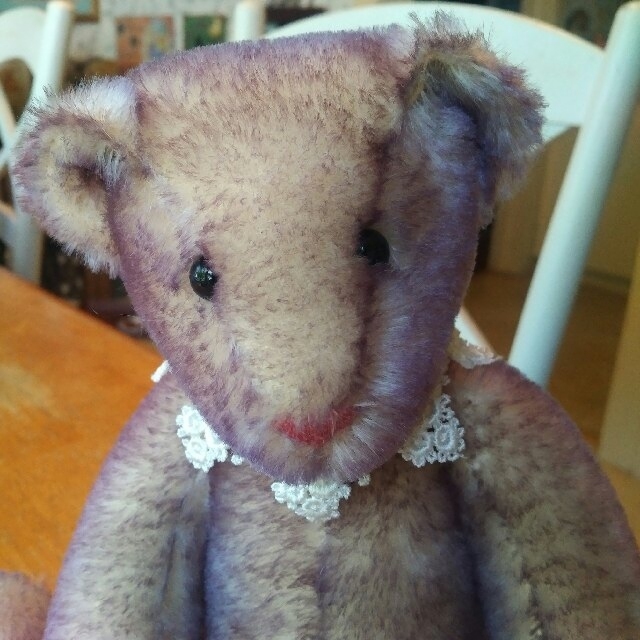 It's another Vermont Teddy Bear Company bear, and I'm inclined to think that it's some kind of special edition, because it's larger than their normal size for jointed bears, and has an embroidered nose. What do you guys think: mohair or curly plush? Doesn't look like mohair to me, LitWit . . . some sort of synthetic, I think. I'm not sure there's a way to tell exactly from a photo, but here's a Vermont Teddy bear of mine that's mohair so you can see the difference (kinda sort of). She's lavender tipped. Well, the bear arrived today, and she is indeed curly plush. However, her beautiful beige fur has been discolored all over her body (which didn't show up in the pictures), and she showed up smelling like cigarette smoke. I tried washing her, but she still looks slightly green in patches. And her head is loose. I'll be sending her in to get that fixed, since I can't tighten the safety joint myself, and I'll ask if anything can be done to help her fur. I feel so bad for her! I've named her Thimble. She's my first girl bear. Bless you for helping her get back on her feet...er...paws! Copyright © 2016 Teddy Talk. All Rights Reserved. Designed by NoMonkeyBiz.